From left: Helen Chang, CAPMHC program head; Iku Kiriyama, Friends of CAPMHC chair; Shirley Ho, board member; Randi Tahara, senior deputy, office of Supervisor Mark Ridley-Thomas. GARDENA — In 1983, then-director Dr. Keiko Ikeda of Coastal Asian Pacific Mental Health Center, located in north Gardena, asked George Kiriyama to form Friends of CAPMHC to support the clients and programs of the L.A. County mental health facility. Kiriyama formed a board composed of health professionals and Gardena Community Adult School staff. Teachers from the adult school taught arts and crafts to clients. Annual fundraisers were held, and the Friends provided buses for field trips and supplies for programs. After Kiriyama passed away in 2005, the board asked his widow, Iku, to take the seat as chairperson of the Friends of CAPMHC. The current board is composed of Iku Kiriyama, retired LAUSD educator; Ginger Wilson, treasurer and former Human Services Program coordinator, CSU Dominguez Hills; Carrie Lew, USC assistant dean for professional development; Shirley Ho, community outreach consultant, Torrance Memorial Medical Center; and Helen Chang, Mental Health Clinical Program head, CAPMHC. Since 2006, the Friends board has provided services without fundraisers through the generosity of Ho, who donated funds from her personal concert to benefit various organizations. The board has purchased a flat-screen TV, speakers, microwave, karaoke machine, books, games, and basic supplies that were reduced by the county due to budget cuts; and provided funds for special observances, such as Lunar New Year, Black Heritage Month and Asian Pacific Islander Heritage Month. A new refrigerator will be purchased in January. 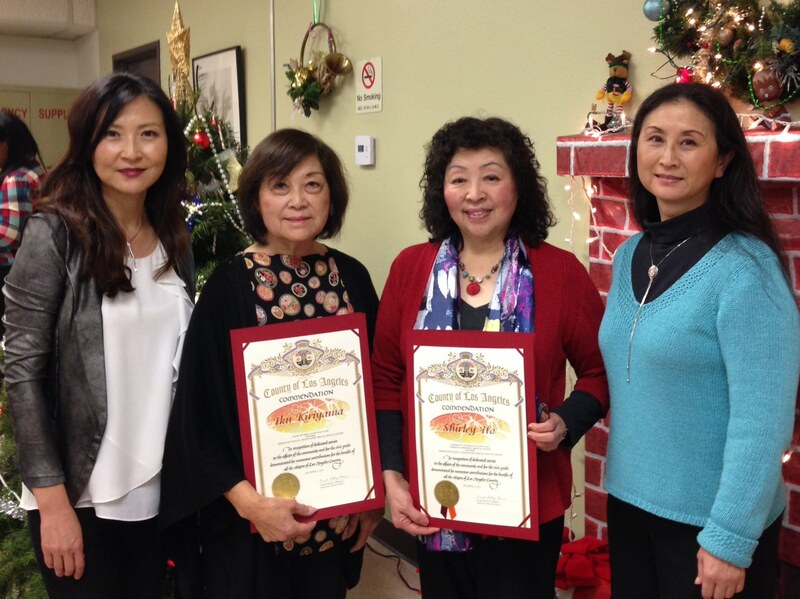 At the December holiday party, Randi Tahara, senior deputy of board operations for L.A. County Supervisor Mark Ridley-Thomas, presented certificates of commendation to the board members. The Friends of CAPMHC is believed to be the only support group of a county mental health facility in the state.